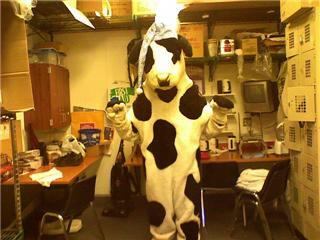 Michael was the cow at Chick-fil-a last night. He loves being the cow. He gets to hug the kids and when they ask him to dance he does the chicken dance. He usually makes a couple of appearances during the family night time. His last appearance includes wearing a nightshirt and nightcap which means he's going to bed right after he says hi to the kids. You can see the nightcap is still perched on his head.